Searching for I am sorry quotes and sayings i.e. quotes which convey your apology. Now no need to search for them anymore. As here I have compiled down some of the funny and inspirational I am sorry quotes. Just hope you like the quote compilation and find the right words for your apology. I love you so much. So, so much, and I probably always will. I just don't like you anymore. I'm sorry. I took it all for granted, I'm sorry to say. Sorry is hardest to say when it matters most. You're my backbone. You're a blessing. You're a piece of my heart. You're the air I breathe. And you're the strongest person I know, and I'm so sorry for having to put you through this and having to put our family through this. Thanks for your nice little note, though i am sorry to hear you find Through the Looking Glass so uninteresting. You see I have done my best, so it isn't really my fault if you think Tweedledum and Tweedledee stupid, and wish that I had left out all about the train and the gnat. Dear you please forgive me for my jealousy I mean no harm it just hurts that you put her before me i am sorry for caring so much. 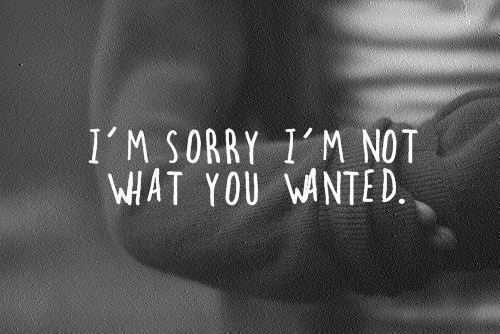 I am sorry, i am not what you wanted. I'm sorry I'm not perfect or what you expect me to be. I'm sorry I'm not plastic. I'm sorry for being the worthless person I am. Sorry I'm a no one.